Complicated and time-consuming workflows and processes are streamlined with a solution based on ArcGIS Server. New system promotes better integration between internal IT systems. Route planning tools ensure better transit service to outlying communities. 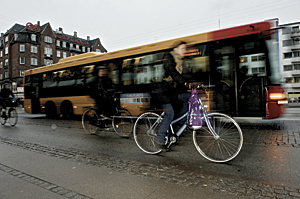 Movia is Denmark's largest public transit agency, serving 214 million passenger trips per year in the Greater Copenhagen area and parts of eastern Denmark. With 570 bus lines and 9 local train lines in its coverage area, Movia strives to meet the daily transit needs of 2.4 million inhabitants with an employment base of 1.2 million jobs. 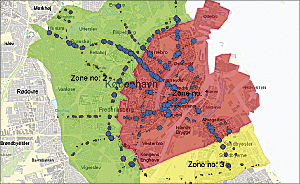 Passenger counts by transit service area. As a public transit agency, planning and maintaining bus routes are vital parts of its business, but until recently, the workflows and processes of transit planners were not as efficient and streamlined as Movia would have preferred. Movia has many dedicated employees, but the transit agency's computer systems and internal processes needed a technological boost to streamline its business processes. When planners needed vital transit planning data, such as demographic characteristics and location of educational facilities for route planning, it became evident that Movia's systems made workflows and processes too time consuming and complicated. The agency concluded that to meet the increasingly higher demands from its customers, it had to make some technical updates to provide the best possible customer service and communications. Movia set some goals that it believed would make the company a global leader in the transit industry. The agency's main goals were to design a more efficient workflow, increase customer service by providing real-time transit information, and create an integrated planning system where all the vital parts of transit planning and operations are integrated into one solution. Movia also wanted to have access to relevant data to perform analyses and forecasting to enhance its transit planning. 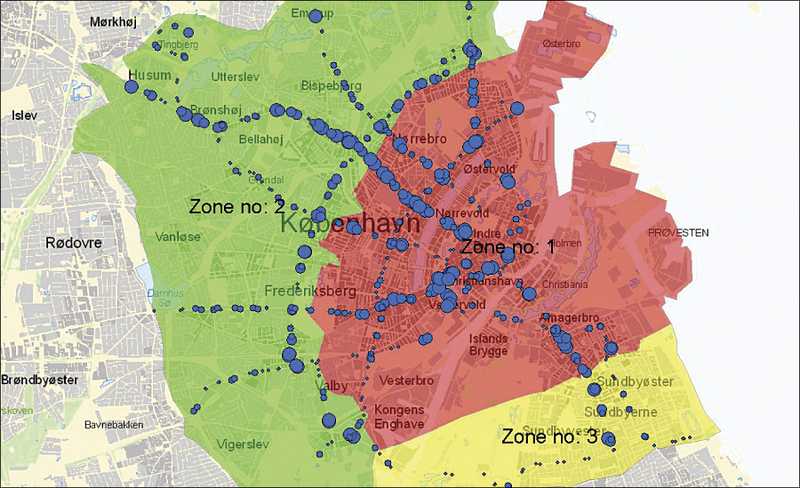 "The core idea was to improve transit planners' workflows," says Movia IT manager Carsten Bo Jacobsen, "by ensuring that they all had the relevant information readily available to them on their screens." The integrated system that Movia was seeking did not exist in an off-the-shelf software solution. Therefore, the company sought a strategic cooperative relationship that could assist in developing and maintaining the desired solution. Movia found that Informi GIS A/S, Esri's Danish distributor, offered the best solution and support to accomplish its goals. A public transit bus during rush hour. "We chose a GIS platform, key in the IT architecture," says Jacobsen, "as we believed that in travel planning and customer information, the map is the key element." Movia selected Informi GIS and ArcGIS Server because, at a strategic level, the pairing had the most to offer in relation to GIS collaboration and product development. Building on ArcGIS Server, Informi GIS and Movia developed GeoTransit, a whole new range of transit applications that seamlessly integrated the information from Movia's existing systems with spatial data maintenance tools. GeoTransit supports Movia's enterprise-wide business processes by providing the tools to maintain the spatial location of stops, routes, patterns, and fare zones along with the ability to integrate current schedule information, passenger counts, predictive travel time information, and real-time road closure information. Before GeoTransit was developed, it could take three days for a driving plan to be assigned to a bus route through a specific area because the required information was located in many different systems. Now that all the systems have been integrated, it takes only a day to complete the same task. The process has become much easier to manage because the system provides direct access to all relevant information, and having more efficient workflows has reduced the time needed to train new transit planners. With GIS as a central part of the IT architecture, data that originally did not have a spatial reference is now linked in the GIS. This gives Movia the ability to better analyze stops by identifying passengers within a specific service area. Movia has also found it useful to identify the busiest bus stops in a service area and show how many buses are running daily at one stretch to ensure efficient route planning. To provide passengers with bus arrival information at select stops, Movia calculates travel speed on selected lines and transmits this information to kiosks. Using the GeoTransit solution, Movia is also able to divide the number of passengers and road map hours into geographic areas to better serve outlying communities. The GeoTransit integrated solution also opens up new possibilities. "We are on track to lift up to a level where GeoTransit not only is a transit planning solution but also provides vital transit decision support," explains Mogens Buch-Larsen, vice president, IT, Finance and Human Resources, Movia. "In the future, we will move in a direction where we can ask the system to make recommendations as to how an optimal network appears based on employment, education, commuting, and demographic data patterns. The system has improved efficiency and allows the analysis of a much wider range of parameters." Movia's GeoTransit solution meets the needs and requirements of a modern transit agency driven to compete with other, more individual modes of travel, such as automobiles. It has allowed more efficient and accurate route planning, ultimately improving the company's overall bottom line. Additionally, GeoTransit has improved opportunities for providing customer information, which in turn has helped increase customer satisfaction and will ensure that more passengers see Movia as a viable transit alternative. With more than 15,000 bus stops, 112 local train stations, and 338 kilometers of train tracks loaded into the GIS system, it is now possible for Movia to gather and analyze valuable data for planning, managing, and monitoring daily transit traffic into one integrated system. For more information, contact Mogens Buch-Larsen, vice president, IT, Finance and Human Resources (e-mail: mbl@moviatrafik.dk), or Carsten Bo Jacobsen, IT manager (e-mail: cbj@moviatrafik.dk), both of Movia.